This recipe calls for Chinese Salted Radish or also called Chinese Preserved Radish, is a turnip that has been salted heavily to preserve like a pickle or sauerkraut. The radish adds a distinctive crunch, umami – a salty/savory flavor to any dish. Usually, it’s minced finely and added to stir-fries, omelets or used as a topping for Chinese congee (rice porridge). You’ll find the Chinese Preserved Radish at Asian markets, packaged in a plastic pouch or tub. Here’s a photo of the package. If you can’t find the Chinese style of preserved radish, try looking for the more popular Japanese and Korean style, which is eaten raw like a pickle. While this is a different style of radish, it will provide the same crunch and saltiness to your dish. 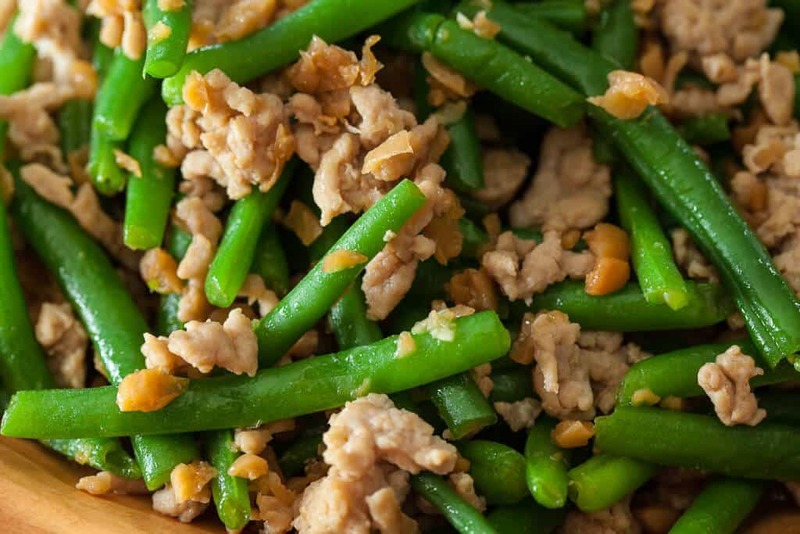 A tip to using Chinese preserved radish is to mince very finely. The radish is very salty, and only a couple of tablespoons minced is all you’ll need for the dish. If your radish is extremely salty, you can soak it in warm water for 10 minutes, then drain to get rid of some of it’s saltiness. In a large wok or pan with a lid, add one inch of water and bring to a boil (steaming rack optional). Add the green beans and cover. Steam until green beans have turned bright green and are crunchy-tender, about 5 minutes. 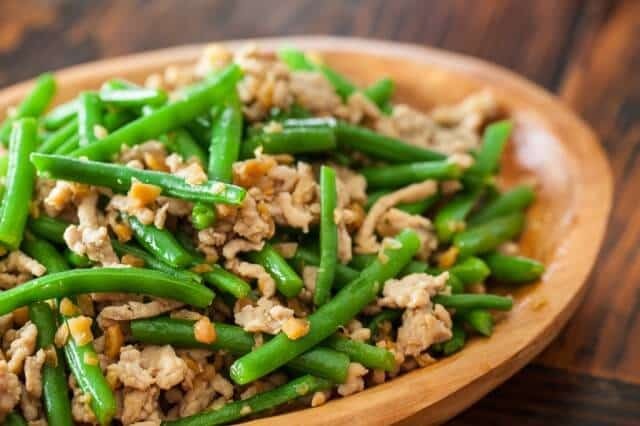 Remove and drain the green beans and set aside. Discard the remaining water in the wok and dry the wok thoroughly. Over high heat, add cooking oil to the wok. 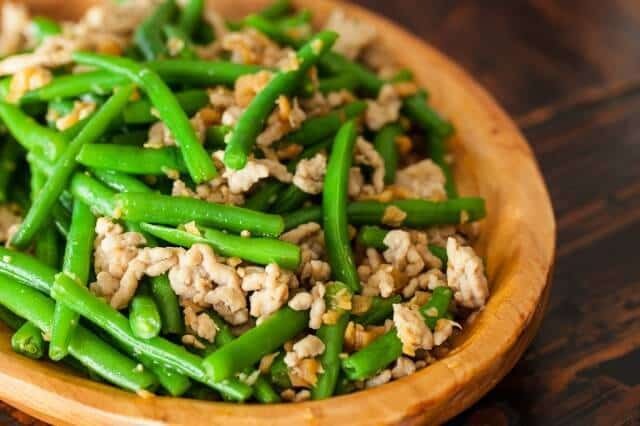 When hot, add ground chicken and stir fry until cooked through. Add the Chinese radish and garlic and stir fry for one minute or just until garlic is fragrant. 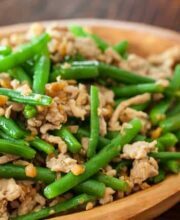 Add the cooked green beans, soy sauce and sesame oil. Stir fry for another minute. Serve immediately. 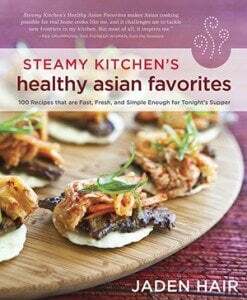 My new cookbook is available for purchase now wherever books are sold! You can also pick up a copy on Amazon for $13.98! 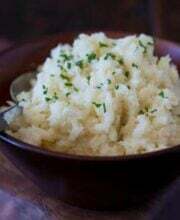 Thank you for posting this recipe reminds me of a childhood recipe my Taiwanese Grandmother used to make that we regularly had with steamed white rice or as a topping on top of noodle dishes. 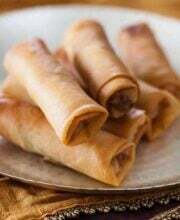 I have found that in Australia Cantonese food is more prevalent than Chinese Food from other regions. It has brought back fond memories and I like how you’ve used chicken instead of pork which I’m cutting back on. 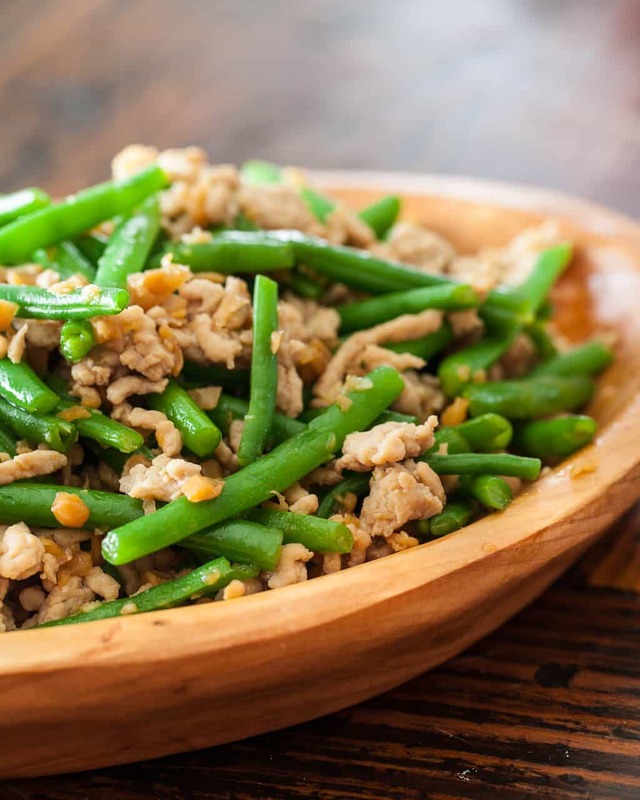 I would like to pass down my favourite Chinese dishes to my children one day I have often found dishes such as this one challenging as I try to not overcook the vegetables and control the oil and salt content. You’ve made it look doable. Thank You. Dumb question, but once I open the package of radishes how do I save them after? I need such a small amount and the package is quite big. Do I need to refrigerate/freeze and for how long are they good? The bottle used is actually not soy sauce, it is “seasoning sauce” brand is Golden Mountain, and actually that is totally different than soy sauce. It is a good base for stir frys but again it is “Seasoning Sauce” not soy sauce. http://importfood.com/sagm0705.html i listed link on where to buy it online. 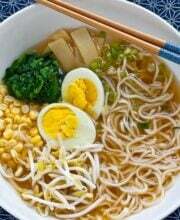 .alsoe you can find this at any asian grocery store. Love this recipe. When i don’t have minced meat, i alternate it with eggs, lap cheong (chinese sausages) and preserved radish. Goes quite well too. Bonus! Not only am I lucky enough to have 3 Asian markets within 6 miles of my house (!!! ), but I found the exact packages of salted radish at one of them, AND I went to a friends farm on Saturday and picked several pounds of green beans… I see this recipe happening this week… yeah me! Hi there Dear, are you truly visiting this website daily, if so after that you will without doubt take good know-how. I love Asian food but always struggle to find ingredients that suit. The result is usually disappointing so thank you so much for this post. 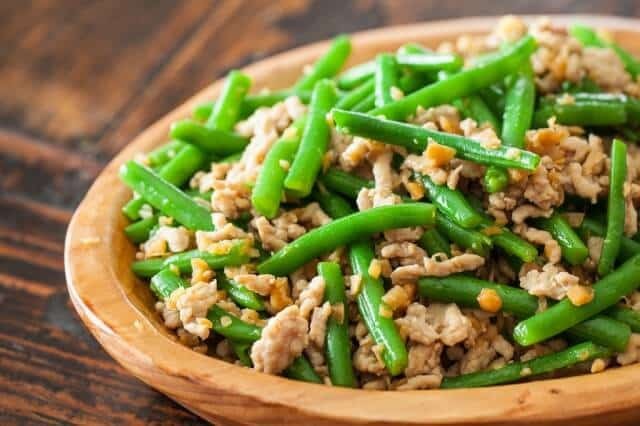 I love that green beans are the star in this dish, because they have earned their place as a nutritious, colorful, and delicious vegetable. I love this idea, and will be happy to serve this stir fry to my family. Happy Easter! When we were running our Thai restaurants in Boston, we used preserved radish (or turnip) in our popular Pad Thai dish, so it’s not “new” to Americans. The ingredient can be found on many dim sum recipes, like daikon or taro cake. Yum, I love minced preserved salted radish, but I love even more is how simple this recipe is! This looks wonderful! Now we need a recipe for Chinese minced preserved salted radish. Yea! 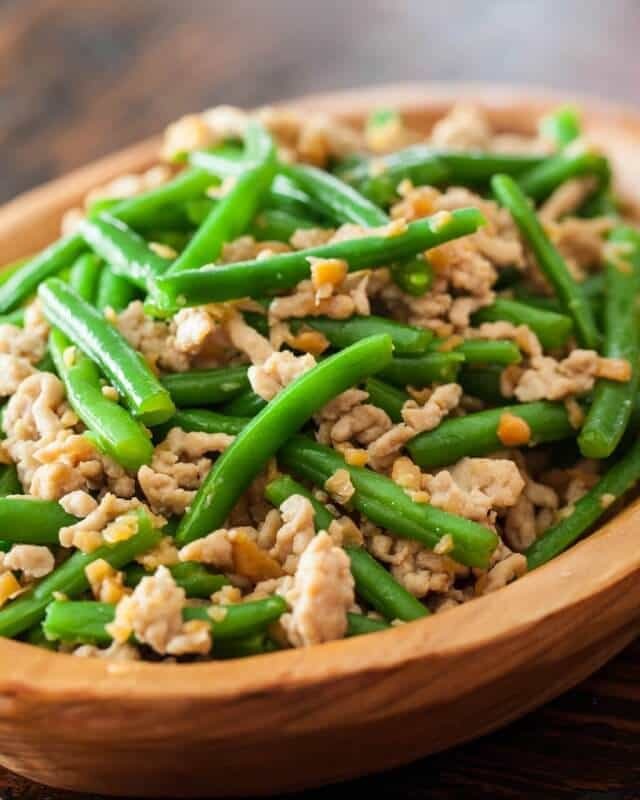 I rarely make it to Asian markets, they are hard to find :\ But maybe I could find a good sub… green beans are practically the only green food my bf will eat!